The Mercedes-Benz 600 is an imposing car, and lots of imposing people owned them – dictator-types. You look at the thing and it’s massive, especially in long-wheelbase form. Nearly 21 feet of Mercedes, which also weighs about 4 tons. But this one represented a first for me. I don’t think I’ve ever been left totally speechless by a car. Anything with the three-pointed star imposes some sort of clout, but the 600 is just, well, jaw-dropping. It may not be tall but it is very large. Unlike a stretched Lincoln Town Car, it’s prestigious and gorgeously designed. But it’s the mystique of the car that gives It has the reputation of being owned by such powerful people, like Ferdinand Marcos (he had four, actually), Pol Pot, Fidel Castro, Coco Chanel, the list goes on. Jeremy Clarkson, for example. 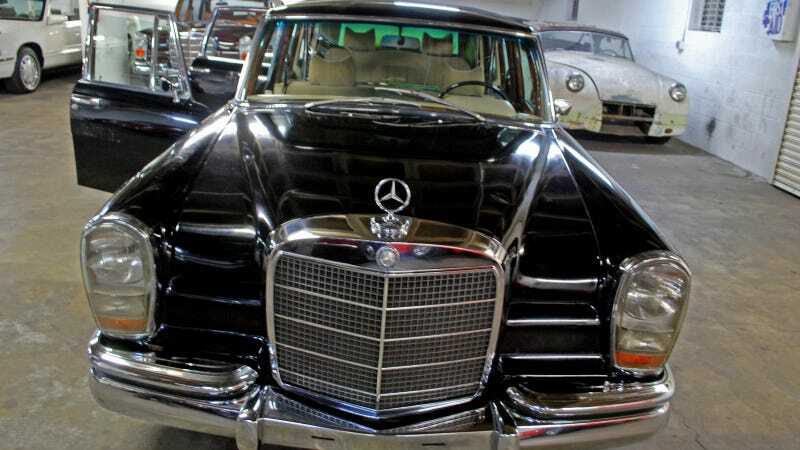 This 1978 Mercedes-Benz 600 belonged to the notorious Saddam Hussein. It’s a special car made even more special because it was used by one of the most infamous dictators of all time, despised globally and hunted for so long before the infamous unraveling of his country all leading up to his death. Anything affiliated with Hussein elicits so many emotions, many of them bad, which is probably why this parade vehicle – no matter how rare and historic it is – has been hiding in the Petersen Automotive Museum’s basement for several years. Saddam’s 600 is a rare model. It’s a state landaulet, with a solid roof over the front seats and a folding canvas roof on the back half of the car. It’s a limo you can stand up and wave to commoners in, and that’s why most of the landaulets went to people who basically owned a country. Every government ordered them specially from Mercedes-Benz between 1963 and 1981, each fitted with different equipment for different requirements imposed by the leader. Curator Leslie Kendall and Marketing Director Chris Brown showed me around the special, scuffed, sandy 600. Kendall says that of the 59 landaulets that were made, something between 15 and 20 were “long roof” models, with the fabric roof extending not only over the rear seats but all the way to the partition that separated the back area from the front seats. Most landaulets only go over the rear bench. This meant Saddam could stand on a pedestal in the rear and stick his head out of the car in a parade. Kendall also said this one is more desirable because it’s a four-door, not a six-door model. Not a whole lot is known about its time as a government vehicle, but the odometer reads just 5,204 kilometers in 35 years. But sometime after the fall of Baghdad and Saddam’s subsequent capture, the landaulet came into the hands of an Iraqi businessman who, Kendall said, somehow managed to get it from Iraq to Jordan. He speculates there was a long discussion with border guards followed by an exchange of some sorts. Money, probably. But in 2006, the Mercedes-Benz distributor of Jordan and Syria contacted the Petersen Museum and basically said “Have I got a car for you.” Kendall and a museum director went over to Jordan and, he said, saw the big Merc under a canvas tarp surrounded by a bunch of run of the mill C-classes and such. The basic conclusion was that Robert Petersen, the late founder of the Petersen museum, had to get this car. He in fact owned one of the first long-wheelbase models imported into the States. And so a deal was done and the abused-but-historic landaulet arrived in LA to sit in the basement. Where it is today. “We made sure everything was legal,” Kendall said. “It’s all genuine and legal. it’s a well-documented car.” He said there’s paperwork from the Iraqi businessman and some other ownership documents to prove its origin. There was sand everywhere and in places it still shows. The upholstery is a sand velour to match (leather was going to be useless in the desert) but it’s soiled as is the carpet. All the ashtrays and lighters are gone, too. The outside is specced with small running boards all around the car and grab handles on the back end. This is for the guards during the procession to stand on and protect whoever’s inside. But after parades in Iraq the guards would get on the 600 and ride it back to base, meaning their belts and guns would dent and scratch and scrape the body. All over the trunklid and in the front there are signs of hard use. To move it from its parking spot so we could open the doors and poke around inside, the Petersen’s staff used a presidential golf cart to pull it. The tires aren’t flat, but the left rear tire is actually the spare that should be in the trunk and the car only has two of its period Mercedes hubcaps. And in the trunk was a Persian rug cut in the shape of a floor mat for the driver, as well as a bottle of water. Saddam’s last water? The whole car gives off the impression of 35 years of hard service and abuse. The doors creak when you open them, it left an oily stain on the ground where it was parked. And there’s no owner’s manual but marketing director Brown found a bunch of booklets telling you how to use the Becker radios and where to get it serviced in Europe, Africa and Asia. It’s not ready for display any time soon. Kendall says he’s trying to find more photos of when it was used by Saddam because right now there’s only one. And the museum isn’t authorized to show it because it’s a bit, um, controversial. As Jason pointed out, the landaulet’s home now is next to a gorgeous short-wheelbase 600 owned by Jack Nicholson and driven in The Witches of Eastwick, in which he basically played the devil – another powerful dictator. Kendall said the short one is basically one of the best 600s in the world, and the other is probably the worst. That starts to show why it’s special and so important to car history. When I told people what the Petersen had in its vault, many asked, “What’s so great about that?” Even car people may struggle to understand why it wasn’t just destroyed after the invasion. All 600s should be worthy of preservation because they’re rare and represent a fantastic piece of engineering, evidenced by the hydraulic systems in these cars. It’s '60s-era Mercedes in every way. The doors, while creaky, still shut with perhaps the most solid noise ever. The fact it’s been owned by men involved in terrible crimes adds to this weird image the model has. This infamous 600 will never be restored and it may never go on display even with the dents and rust and other imperfections. But it has stories to tell the way it is and represents the life it lived and the piece it has in world history. It is truly awesome, shocking, haunting and fascinating all at the same time.